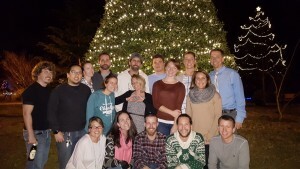 Had another fine Honey Badger Holiday Party this season. It was an excellent turnout, and a lot of fun. It was held at my home for the second year in a row, and I was glad to at least have a couch this time around that they were able to sit on. I suppose I’m getting there slowly but surely. Many brought amazing treats or beverages. It’s really great to see so many contribute even when we’re not playing a team sport. A pretty great bunch. We picked teams (my partner was multi-defending champ Cait), and got started on some games. First off was Hannukah, Christmas, Kwanzaa. It’s just a variation on rock, paper, scissors, but oh so much fun. Then we played the Christmas Ornament game, which involves moving an ornament across the house by blowing on it. Again, a fun time to watch others. We then had a round of Honey Badger Trivia. After all that fun, we had our gift exchange. Jen provided all the rules, and the exchange began. All went well, everyone came away happy and it was a good time. I got some card based games. In a surprise gesture, the team created an amazing Honey Badger card (it really is awesome), and were incredibly generous in giving me gift certificates to Home Depot, Wawa, and Amazon. I mean they were really generous. So very kind of them, again they are pretty great. 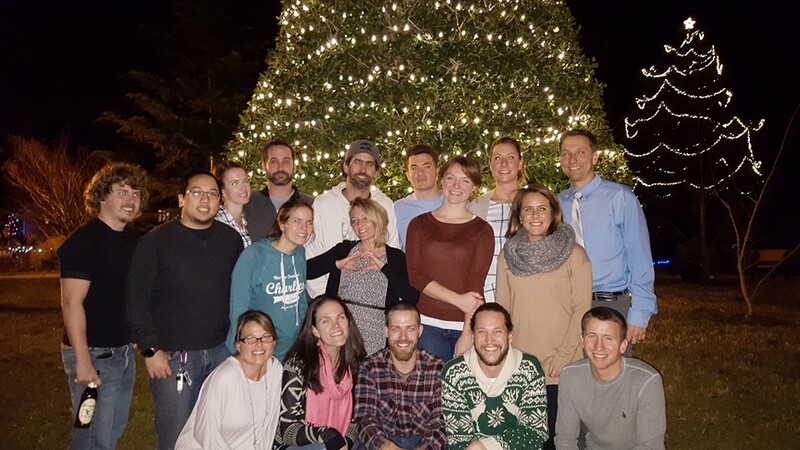 I then coaxed the team into having our photo taken in front of the Christmas tree at the arboretum. It’s a pretty scenic spot, and just a few steps from my home. Everyone was a good sport, and we got a pretty amazing Honey Badger photo. We then returned to play some Marit Kart 8. People then began to slowly slip out as it was on a weeknight after all. All in all I’d have to say it was another success! This installment of the Honey Badger Fun Day took us to R and J Farms for their Cornfield of Terror. We’ve done the corn maze in the past, but decided to be a bit more brave this time and enter the Cornfield of Terror. We got tickets then waited in line for a little bit. The line wasn’t too bad, however had we arrived a few minutes later it would have been an entirely different story. A tractor picks up a group and takes them away into a maze of corn. The driver was a good sport, and put on a solid act. While on the ride to the Cornfield of Terror and chainsaw wielding guy and Mike Myers paid us a visit. They both did a really good job. Myers smelled weakness and taunted a poor old lady for most of the ride. Once we got off the hayride, we could enter the fun. Sadly a poor girl in front of us got a bit too scared and backed out at the last second. We did attempt to cheer her up and encourage her that there was nothing to fear, but alas I don’t think she ever went in. Walking through the maze was a lot of fun. Again, I though the various actors did a pretty amazing job. My favorite was their taunts. They did a great job of taunting a “blondie” throughout most of the maze. It was quite funny to overhear. The guys also did a great job of popping up out of nowhere, running by, and a scarecrow come to life was well done too. What really stood out to us was a green fox laser light tunnel thing. It was really awesome looking, wish I had a photo of it. All in all it was a very fun time, and I was very impressed with the experience. It was a lot of fun and I’m glad I got to take it in this year. Dustin and Ginny’s wedding was a fine time. The ceremony (I believe that’s what it’s called) was on the beach in OC. Parking turned out to be quite interesting, it was a Saturday in OC after all. Glad that I had left plenty early, I eventually did find a spot several blocks away. Chairs were beginning to be laid out as I arrived. As one of the first to arrive, I found myself letting others know that yes, this was the location. Met some interesting folks for sure, all very polite. The beach scene was nice and pretty quick. Before I knew it, all was done. It was interesting to watch folks dressed up walking on the sand. I didn’t get nearly as much sand in my shoes as I though I would. Things then moved to Greate Bay. I’ve been to a few weddings there over the years, so I had a good idea of what to expect. Immediately upon arriving I began to eat, and eat a lot. I was quite famished, plus it gave me an excuse to not have to initiate conversation with people I didn’t know. A few people sang and play instruments. It was nice. Jared, the best man was a nervous wreck with having to give his speech. There was no hiding it, you could smell the fear on him. As a long time friend I did my best to calm him down and let him know he’d be fine. Despite my encouragement, when speech time came I was expecting bad news. He is not known for his public speaking skills, or any speaking skills for that matter. However, I must admit he got up there and spoke from the heart and seriously gave one of the best speeches I’d ever witnessed at a wedding. It was truly a clutch performance, right up there with the catch (from dodgeball). An amazing moment that I will surely never forget. My amazing table was table 5, and it seemed like a collection of wedding misfits. I fit right in. They were great, very entertaining. They couldn’t believe my age which did bring a fine smile to my face. They were a lot of fun. All in all it turned out to be quite a fun time, and they both seemed so very happy. Very glad to see that and I wish them nothing but the best. For Dustin’s bachelor party we were going fishing on a boat. While I have gotten slight motion sickness on a boat before, it was never anything too serious. So I was hoping that going further out into the ocean to fish wouldn’t be so bad. About 15-20 minute into the voyage I knew I was in trouble. Not only was a random kid on the boat just completely out of the blue staring and hugging me, but I knew I was going to be sick. Oh, and we had about 6 more hours to go. I got so sick that all I could do was find a place to sit away from people and just weather the storm. I managed not to throw up into 2 hours in, but once I had to made sure to wrap my arms around a rail in case we hit a big wave and not fall overboard while vomiting off the side. I’m not going to lie, it was a pretty horrible day. Knowing that you have absolutely nowhere to go to get away from the nausea, and even a best case scenario the ride back to shore would take an hour and a half if they called it a day early. Yuck, no fun at all. I currently hate boats, fish, the ocean, fishing rods, bait, water, wind, waves, and all the people on the boat (even though it wasn’t their fault at all and they were a big help). Was a bit excited and nervous to caulk a shower this weekend. I’ve noticed that some of the trim outside of the shower had gotten wet. So, water was finding it’s way out of the shower enough to take notice. I did some research on how to caulk, there were some excellent videos and tutorials. I stopped using the shower for a few days (glad I bought a home with 2 bathrooms) and picked up some supplies. Went with the white silicone bathroom caulk. Figured white would look better in this case than clear. Removing the old caulk was a little bit of a pain. It really sticks on there well. A razor and some patience helped me remove even the pesky parts. I then cleaned a bit more and waited a day or so for it to dry completely. I did do some practice caulk runs on some pieces of cardboard. I can get a bit excited and was a bit afraid I would squeeze that gun much too hard and wind up with way too much caulk. Practicing was an excellent idea. After a few lines, I was confident to begin. It was a pretty quick process. The gun came with a very useful little tool that really helped to run over the caulk and create a really clean looking line. I’m still giving it a little bit more time to dry from yesterday, but am eager to see if it prevents the water from finding a way out. Wow, hard to believe I turned 38 on Thursday. It doesn’t really hit me how old I am until I’m asked my age. But when I do the math is does add up. This year I just went to work as usual. I got a very cool DC comics Green Lantern vs. Sinestro Lego set. It’s not easy to put a set together during a work day, but I did complete it with just a few minutes to spare in the day. It’s a pretty cool one, I like the see thru green pieces. I was pleasantly surprised to receive 3 peanut butter cookies. They were really good! Plus got a chance to play a little bit of ping pong. Good times. I was beginning to think that perhaps my co-workers hadn’t planned anything, but fairly late in the day I saw people walking to the meeting room. Which surely can only mean that a cake was in the building. It was cool, they put a foam replica of Mjolnir (Thor’s hammer) on the cake. I pretending it was difficult to lift, but eventually lifted it and then went on to slice up some cake. It was a pink plastic knife, no sure why but that stood out to me. Work birthdays have been most awkward here, and this one was surely no exception. I cannot explain it, but when everyone is together in that room there’s just an awkwardness that is present but difficult to explain. I felt really old when they asked me what my age was. I then stopped over my parents for some chicken parm and an ice cream cake. More food! They gave me some grilling supplies. So I should get that grill working soon. Didn’t do too much after that. I was a bit worn out with the longer work days this week. All in all not too shabby of a day.